Look, we all had fun last week except for the poor, dumb idiot who had to upload all that nonsense to the site over a connection that can barely make it through a whole YouTube music video. He did not have fun and I know this. Most of today’s update is the unfun stuff that I need to do to make the site better. Game Index – Engine update includes listing multiple companies along with links to Company Index pages on the Game Index page. Capcom Classics Collection volume 2, Pocky & Rocky (SNES) added. Company Index – Jaleco (who I thought I’d added already) and Natsume were added to the index. Logos – Kiki Kai Kai (arcade), Pocky & Rocky (SNES), Spartan-X (arcade) added. A contributor by the name of Randomish sent logos for Spartan-X and Spartan X 2 (Famicom), Edono (S.Famicom), Nightmare Busters and the unfinished SNES Batman game by Software Creations. Site work: I finally finished removing the gray gradient backgrounds from the last hundred or so 32 x 32 portraits seen in the Company, Game and S-File pages. You can’t tell in most places because I copied the gradient as a background pattern that appears behind those graphics on the page but it’ll be more obvious once I start using them in things that have unique backgrounds. GroupShot – Unknown Soldier (MvsC edits made to look more like the in-game characters) and Dieter (Brawl Brothers/Rushing Beat Ran). I won’t be able to make any big updates for a while. I, and many other people in this area, have been going through some internet connection problems since late June. They’ve been slowly getting worse to the point where I usually can’t watch a whole music video on YouTube without my connection dying at least once. I usually have to unplug and replug the power to the modem to get it to kick back on almost right away but the connection just stays out for a while every once in a while. I clocked my upload speed at midnight and it ranges between .20 and .12 Mbps, less than half of what I’m supposed to be getting. A few files randomly fall through the cracks every time I upload and I found this out the hard way during the July 19th update. I didn’t have any big updates planned right away but this also keeps me from uploading any large files and I’m pretty sure that no video uploads to YouTube will make it all the way through. Expect updates to be a bit light until this gets resolved. GroupShot Scenes: TMNT: Turtles in Time – Vs. Stage (customized and partly redrawn. Still need to redo the fence and pipes), Dungeons & Dragons – SOM title screen, Golden Axe Vs. stage 01 (with arcade graphics), Vampire Hunter/Savior 2 – Deserted Chateau. Jake and Simmons: I’m currently working on the vests and you can see previews in both the GroupShot Maker and the 2010 Brawlstreet banner picture where Simmons is catching Adam’s elbow. Simmons will probably be first because I’m still working out how I’ll draw Jake’s beard. Minus World: There are three of the old articles that still need to be redone and returned and two can easily be merged into one topic. One needs more artwork even though I’ve been drawing pictures of this for years and not really telling anyone. Comic book/cartoon/toy update: Due to the spotty Time-Warner internet connection everyone in this area seems to be having, There’s no way I’m doing a giant update like I did this Monday until it gets fixed. I’ll probably make it a series of updates with lots of new geek genre additions. That’s all for now. Have a good weekend and check out Illmosis on Sunday to see the whole picture from that new “Most Evil” MW article and progress sprites for Radd Spencer and Lord J. Back in the old days of the site, I’d update on Wednesdays because that was weekday that I had off from work. I’d either ride my bike or walk up to the library and upload the new pages and graphics from a bunch of 3.5 floppy disks. Updates happened on Wednesdays for years so I couldn’t let this anniversary week go by without a little update. Sprite Rips – Mrgrill247 has assembled and aligned a set of Maria Renard sprites from the PSP version of Castlevania: SOTN. Thanks again for the donation, kind sir. Sprites – Mega Man’s sprite page somehow managed to get left out off of the sprite menu so I fixed that and threw in standing sprites of him in different mode colors from part 1 and 2. Again, you can find far more Mega Man sprites everywhere else on the internet but I was ripping them for reference and decided to add them to the site. There will be one more update some time this week of unknown size including even more things being added to the Graphic Generators. 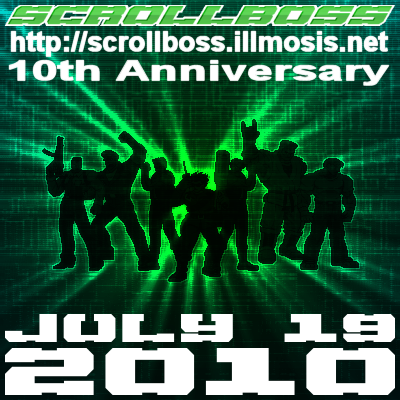 Ten years ago today, the website ScrollBoss was born. Ten days ago, this site reached it’s 100,000th hit since mid-2005 when I had to reset my counter after moving to Dreamhost. Not bad for a place that I really don’t promote much. This big update wasn’t made to pat myself on the back. It’s a gift to you people who stop in to see what’s new and haven’t just given up on waiting for this place to get it’s act together. You really keep this place going by showing up, linking to it, giving positive feedback and more. The updates haven’t been as big as they used to be since I’ve been busy with so many other things, mostly my non-pixel art, so I think I owe you all a big, crazy update like this. Almost the Entire Site – Just another slight update with more visual touches than the last one. There will be more tweaks as time go on. Please let me know if there are any broken pages due to the changes. Certain areas are being grouped together with pagetop navigation that will hopefully make casual browsing a bit easier. The biggest change is the “Info Center” group with the S-File character profiles, Game Index, Company Index and Vernacula-X glossary. Other little changes include the new graphic in the corner of some pages. Yes, the jumpkick-S is gone. Konami: Sledge from Crime Fighters 2/Vendetta. Blood’s jab (from the Brawlstreet banner) finally added. Nintendo: Samus in her NES & SNES non-armored forms and the Zero Suit. Sega: Joe Musashi, Ax Battler and Gilius Thunderhead in magic-use pose. Solo versions of the SoR1 Adam and Blaze intro sprites added. Technos: Jeff (headswap version from DD1) added along with new Billy and Jimmy Lee sprites. Also, the CvS Alex and Ryan sprites seen in the Vs. Maker were added to the Kunio-Kun section. Marvel: Deadpool (yes, finally) in a familiar pose. the Minus World – One of the last articles from the 2000-2002 time of the section has just been remastered. It’s all about The most evil man in video game history. The Minus World is another site section that got a slight style update. It’s a lot like the Vs. Maker but you can make group shots with sprites. You’ll find more variations in the pictures sizes with this one. There’s one screen that lets you recreate a classic title screen formation in a 160×160 pic. 1989 – the Beat-em-up article was improved. While that’s all there is to this update, it’s not all of what I wanted to finish. In fact, it’s not even close. Since I still considered this a year-long celebration, you’ll see a few more big updates sprinkled through the rest of the year like a big comic book-related update, a MUGEN-y update and so-on. I hope you enjoy this update and have more fun with it than I had making it. Enjoy the new stuff in the generators and please let me know if something got broken in the update. Thanks for showing up and I’ll see you later this week! Yes, that means there’s another update coming. edit (1:51 PM EST) : I was so busy that I sadly forgot to add another kind contribution from Mrgrill247 and Anapan to the Sprite Rips page a few weeks ago. That has now been fixed because their pack of Castlevania:SotN Maria aligned sprites are now on that page. I also updated most of the Company Index pages again because some were still linking to older versions of the Custom Sprite pages. The July 19th update will be big. It will probably be the biggest update I’ve ever done. Lots of new content and lots of changes. Company Index – Index and company pages redesigned. Temco has finally been added. Sunset Riders’ heroes were added to the character list on the Konami page. Game Index – Index and game pages redesigned.